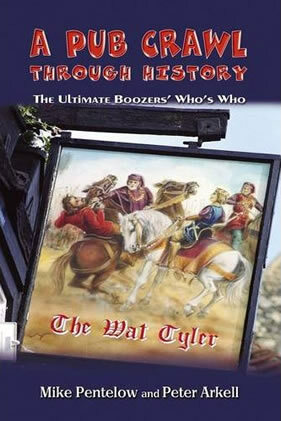 David Douglass reviews a unique history book based on signs and names of pubs. Told through the pub signs of Britain, the authors have created a unique history project. The book is the boozing road to knowledge and the authors entered this journey with dedication. Some 200 pubs were selected on the basis of their signs and names. Each one was visited and its wares sampled. Research into the history of the pub involved both customers and landlords. Many a local knows the story of the pub, the history of the sign and the character it depicts. Still others hold surprising ongoing connections to the figure on the swinging sign, and demonstrate deep local connections between past and present, myth, fact and legend. Here we have heroes and heroines, the great and good, the poor and lowly, engineers, highwaymen, pirates, wise women, kings and pretender kings, politicians, prostitutes, courtesans, revolutionaries, war heroes, sportsmen, poets, artists, authors, diarists, musicians, singers, performers of all sorts from all manner of platform from stage to parliament, from shipyard slip to flickering movie screen. There are figures from the sea and maritime legend, the authors and preachers of tracts, religions, and philosophies as well as leaders of revolts from near and far. This book is not for the coffee table. No this book is for the glove compartment of the car, for the “What to do and where to go” information stack. It is a drinking historian’s map and compass guaranteed to keep you chuntering over your beer and happily engaged for many a year. It might end up as a untimely tribute too to the fast vanishing local, the country pub, the street corner pub, the hub of countless communities through decades and centuries. The pubs are now falling faster than the trees of the Amazon, and if the drop into poverty and depression deepens, many another is destined to follow them. The book is written by Mike Pentelow, long time progressive journalist and member of the NUJ for 40 plus years and the recent author of Norfolk Red: The Life of Wilf Page, Countryside Communist (Lawrence and Wishart) and Peter Arkell, a radical photographer since 1970. Peter will be well known to the mining communities for his fearless journalism along with Ray Rising in the hot spots of our picketing operations and for the dynamic photo history Unfinished Business. Both authors are to be congratulated for this unique take on history and for telling the stories in such a novel and thought-provoking fashion.